When choosing paint colors, it's good to take some time to decide. 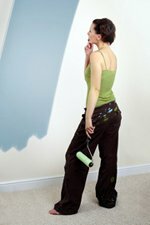 Its easier to adjust your paint colors to curtains or a special piece of furniture, than the other way around... If you want to speed up the process, think of using a color picking tool, such as house paint software, or the Paint Color Cheat Sheets. Further down, you'll find more info on choosing paint colors, and here on making color schemes. 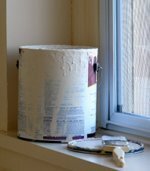 The way new paint colors will look, depends a lot on the styling of your house. Choosing paint colors really is the closing piece of your interior design - they should support your own style, your own look-and-feel. This is not about given rules, only about a certain 'logic' in putting things together, and to be consequent in that. This logic might very well be, to put everything together that you like. In that, you might use some general designing skills as a 'tool'(scroll down for that). Consequence is what matters: decide on every detail - take nothing for granted. And of course you can pick one or more styles as a theme, if you have preferences. If you're new in this, and have trouble defining your style: check out here for some good ebooks on creating your own interior design. These ebooks guide you through the creative process, and also contain very down-to-earth practical tips, to make a home the way you like it. All the things in your room add together to a palette of materials and colors. A piano, furniture, curtains, rugs, vases, pictures, all these things are ingredients, to turn into a system: an interior painting design. You decide whats important. 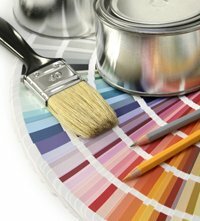 First, find all the other elements of your style, then complete the whole by choosing paint colors. Here you'll find info on how to create a color scheme. 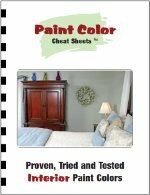 If you want to choose fast, you might think of using the Paint Color Cheat Sheets (click here for a review). This is basically a list of 'good' paint colors, put together by a color consultant who condensed years of real-life experience in it - safe colors, beyond the limits of offwhites or beige. Each color has some info to it, on what lighting and primer they need, and other colors to combine them with. Via the banner below you can order it. For most of us, it's hard to imagine beforehand, what your room (or the exterior of your house) will look like when your walls have a different color. But good house painting software was developed for that. 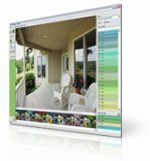 It allows you to digitally work over your picture with existing interior paint colors. Initially, this program was developed for painting contractors. 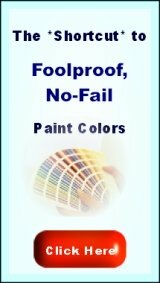 You first might order paint samples to try out the colors in real life, and after that you can order them by number, in any sheen or even as a primer, here at ThePaintStore.com. In choosing paint colors, tonal value (light and darkness) is just as important, than having the right colors. In general, its nice to have light, dark and medium colors in a room. You can check tonal value by looking at the room through your eyelashes. Then you see everything in a sort of black-and-white. What colors will you paint over? Sometimes you can patch up the existing color by painting the right color over it - in just one layer. Bring home different yellow-brown and brown paint sample strips from the paintstore, and hold them to your furniture. Pick the one that's closest, and use it to compare it to other paint sample strips (and see if they work well together). New lightwood can be as light as an offwhite, older lightwood gets more in the yellow ochre or even orange section. New oak can be greenish-brown, older oak is more of a warm brown. Cherry wood has green and pink stripes in it, and mahogany wood is more of a toned burgundy. Blue colors in the room will give your wood a warm look. 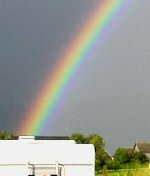 What do you want your colors to do for you? Should they be in the background and not call for attention? then you need off-whites or neutrals. They can be warm or cold. Are you looking to complete a certain nostalgic style or feeling? Or is your room in need of a little zest and flavouring? then go a little bolder in your colors. If you want to make a solid based choice, its good to take your time for making an interior painting design. Artworks, especially the more classic ones, already contain a color scheme. You can take a painting or a rug that you like, and pick colors from it. 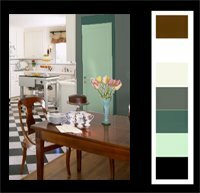 It will help you a great deal in creating a harmonious color scheme. 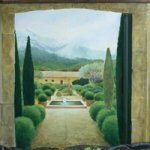 You don't have to put the painting in the room (you can, of course), but the colors will communicate its 'feel' all by themselves. Apart from matching colors to your flooring or furniture, it's also good to adjust them to your available light. Old paintmakers used to do that manually - I got the recipe back for you. No matter what colors you choose, it will give them a very pleasing, 'just-right' look. There's software available in which you can upload your own pictures. After some preparation, you can color them with the actual hues of interior paint colors. It gives a realistic picture of your results, a great help for getting an idea of how your colors will work in your interior - which is great when you're choosing paint colors for big surfaces like walls or floors. Where do your colors go? When choosing paint colors, get samples and hold them to the walls where youll paint them. Then youll see how the color will come out. If the color oozes, it has the right tonal value for that situation. What's good for your room, depends on the size of it, and the amount of daylight that you have. In general, youll want to keep the ceiling lightest. Its in the shade, while nature outside gives us the light from above. There are exeptions: especially in old homes with high ceilings, or cottages in the countryside, dark ceiling-beams or dark panelling can look very good. They give you a protected feeling, very natural if you house lies amids of nature. Then, a dark ceiling can be a nice counterweight to all that open sky. Walls can be a little darker. When you have strong colors, its better not to paint all the walls in the same color. Shade them, and eventually keep the walls that are more in the dark a little lighter. Shading will give your eye some variation. In general, its good to have the floor darker than the walls, and the ceiling lighter than the walls. But sometimes the rules need to be broken. If you have the floor a little lighter, it will seem as if light is shining on it - thats nice too. A very dark ceiling can look spacious too - as if it's just gone. But a dark ceiling only works that way if it isn't lit. And dark furniture on a very light floor can look way too heavy.